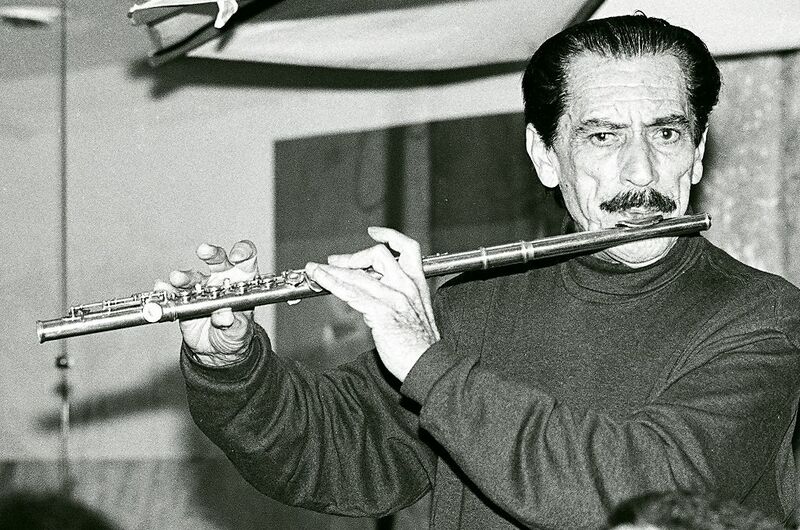 One of the most important choro flutists ever, Altamiro Carrilho put together a solid virtuosity and an ease for improvisation that in his 58 years as a professional artist (completed in 2001, having recorded over 110 albums) brought him the praise of both classical and popular renowned musicians, along with a consolidated popularity. His trademark was the insertion of excerpts of classical pieces into choro, and vice versa, as he did in the cadenza of the Concerto #2 in D Major KV 314 ahead of the Orquestra Sinfônica de Porto Alegre (1976). As an accompanist, he worked with Orlando Silva, Vicente Celestino, Elizeth Cardoso, Moreira da Silva, Francisco Alves, Sílvio Caldas, Caetano Veloso, and Chico Buarque, among many others. His maxixe "Rio Antigo" sold 960,000 copies in just six months back in 1956, bringing him national fame. Carrilho also presented the highly successful TV show Em Tempo de Música, and toured through many countries, having being praised as one of the world's best soloists by conductor Boris Trisno. As a classical music soloist, he played lead on several orchestra pieces like Mozart's Concert in G at the Teatro Municipal do Rio de Janeiro (1972). His album Clássicos em Choro was awarded with the Villa-Lobos trophy as Best Instrumental Album, and his Clássicos em Choro No. 2 won the gold record. In 1993, he was awarded with the Prêmio Sharp as the Best Arranger of Instrumental Music for his work on the album Altamiro Carrilho -- 50 Anos de Choro, and, in 1997, he won it again for the Best Instrumental Album, Flauta Maravilhosa. Having four generations of musicians and conductors in his genealogical tree, becoming a flutist at age five was somewhat natural for Carrilho. Since he was nine, he had started working because of his father's illness, but he continued to study music at night. At 11, he joined the Banda Lira de Arion playing the snare drum. When he was 16, he moved to Niterói (Rio de Janeiro) and became a regular at the radio shows presented by Dante Santoro and Benedito Lacerda. During that period, he won first place in Ary Barroso's novice show. His improvisational skills soon brought him invitations to join the groups led by César Moreno, Canhoto, and Rogério Guimarães. He recorded for the first time in 1943, on a Moreira da Silva album. His first record as a solo artist was recorded six years later, with his choro "Flauteando na Chacrinha." His own regional (small group) was formed in 1950 to work at the Rádio Guanabara. In May 1951, he joined the Regional do Canhoto, replacing Benedito Lacerda. Working at the Rádio Mayrink Veiga, the group accompanied the biggest stars of that period, like Orlando Silva, Vicente Celestino, Moreira da Silva, Francisco Alves, and Sílvio Caldas. In 1955, he formed the Bandinha de Altamiro Carrilho, and, in the next year, he achieved national success with his maxixe "Rio Antigo." Through the TV Tupi show Em Tempo de Música, he and his Bandinha attracted large audience levels for two years. In 1957, he was replaced by Carlos Poyares at the Regional do Canhoto. From 1963 to 1969, he did several international tours through countries like Spain, Portugal, France, England (where he recorded programs for the BBC and NBC), Germany, Lebanon, Egypt, and the former U.S.S.R. (for a three-month season in which he was praised by the conductor Boris Trisno as one of the world's greatest soloists). Carrilho continues to perform and record, and was decorated in 1998 by the President Fernando Henrique Cardoso for his services to the country. One of the most important living artists in the choro genre, Carlos Poyares has recorded over nine solo albums and participated in countless others as a sideman. As an actor and flutist, Poyares worked in nine films. As a member of the third generation of a family of musicians, Poyares learned the rudiments of flute with his mother, a concerto player. At five, he was given a tin flute. Three years later, he ran away from home to work in a circus, where he worked as a trapeze artist and several other jobs. 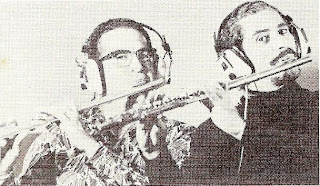 Leaving the circus, Poyares worked as a flutist for the Rádio Espírito Santo (Vitória). In 1953, Poyares moved to Rio de Janeiro and worked for several radio stations. In 1957, he substituted Altamiro Carrilho in the Regional do Canhoto (at Rádio Mayrink Veiga). 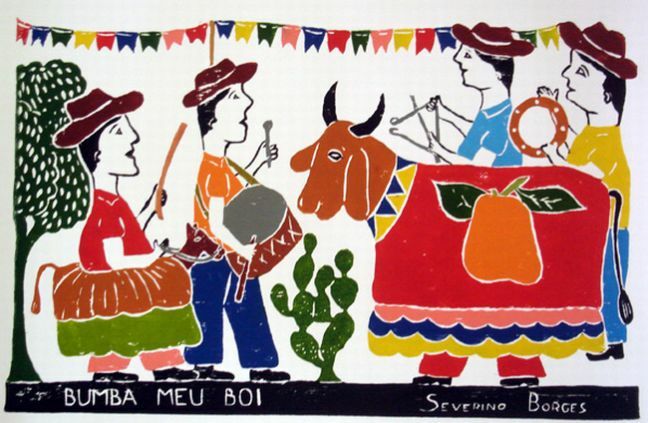 Poyares worked in several nightclubs of Rio and São Paulo while recording as a session musician at the same time and participating in the historic show O Samba Pede Passagem with the Opinião group. 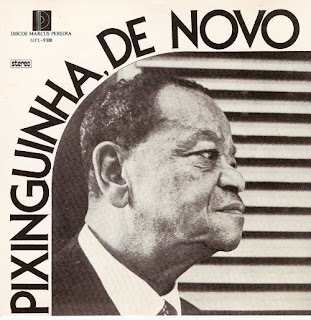 He recorded his first album in 1965, Som de Prata, Flauta de Lata, which was awarded for his ingenious use of his tin flute in complex arrangements and improvisations. In 1994, Poyares toured Europe as a soloist, performing in France, Spain, Holland, and Portugal. 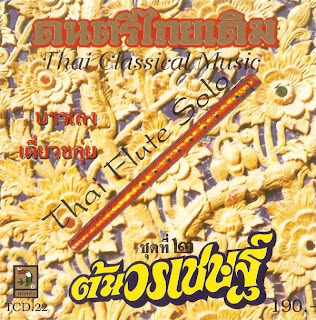 The khlui is probably the first wind instrument which the Thai devised themselves, although the shape of the instrument is very similar to that of the mu-ra-li of India, which is used to play music in worship of Krishna, one of the Hindu gods. 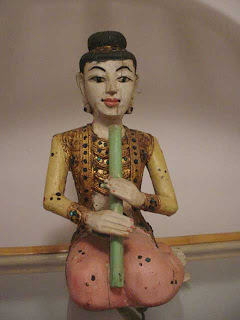 The Khlui is similar to a Japanese flute called the Shaku-hachi. The Japanese Shaku-hachi and the Thai Khlui are played vertically like the western oboe and clarinet. The Khlui is made of hardwood, such as Mai Ching Chan or Mai Ma-glua (black color).After cutting and hollowing, the instrument is carefully dried out over a fire.On the front side ,seven small round holes are made in a row over which the fingers sit,opening and closing the holes to change the pitch of the sound.No reed of any kind is used. The mouthpiece consists of a piece of wood inserted into the opening on the end.Near the opening on the underside is a rectangular hole cut diagonally and slanting in towards the inside of the tube.The Klui must have this cut in order to produce sound.Another round thumbhole similar to the finger holes can be found less than half way down the shaft on the underside. Above the thumb hole ,but on the right side of the instrument as it is held in playing position there is another round hole called "the membrane hole",covered by thin tissue paper. At the lower end of the body are four more holes made in pairs at right angles to each other.A cord or ribbon is put through the holes going from right to left by which the instrument can be hung up or held by hand.All in the klui has fourteen holes. Khlui Lip This is the smallest sized khlui, measuring 14 1/2 inches in length and 3/4 in width. Khlui Pheng Aw This is the middle-sized khlui, measuring 18" in length and 1 1/2 inches in width. Khlui U This is the largest-sized khlui, measuring 24 inches in length and 1 3/4 inches in width. Ignacio Piñeiro Martínez (Havana, 21 May 1888 – 12 March 1969) was a black Cuban musician and composer whose career started in rumba, and flowered in the rise of the son. He was one of the most important composers of son music; in total he wrote about 327 numbers, mostly sones. Piñeiro was a brilliant rumbero who worked with musical groups from 1903 onwards. 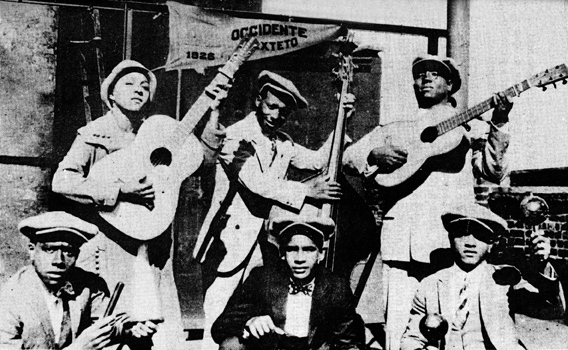 In 1906, was a member of the Timbre de Oro clave y guaguancó vocal group, and later directed Los Roncos guaguancó group. He was taught the double bass by María Teresa Vera, and in 1926 he was a member of her band Sexteto Occidente, which recorded in New York. In 1927 he founded the Sexteto Nacional; its original name was El Sexteto Nacional de Ignacio Piñeiro, and he wrote all its original numbers. Later, adding a trumpet, it became Septeto Nacional. For financial reasons, he quit the group in 1935, and it was led by the trumpet player Lazaro Herrera until the group disbanded in 1937. Piñeiro became for some years the leader of Los Roncos, a rumba group, for whom he also wrote pieces. The Septeto Nacional was recreated several times from 1954 onwards, initially under Piñeiro's direction. It still exists. At the end of the 19th Century in the sugar cane and coffee plantations of the Cuban 'Oriente' region, two different music styles began to combine: the rhythms of Africa and the songs of Spanish heritage. The result was a new music: the Son Oriental whose popularity, in the beginning, was limited to the rural areas of its origin. Officially it was classified as frivolous and indecent. However, its fame spread quickly to the urban neighbourhoods of the main cities in the region. At that time Son was played by small combos composed of three to five musicians. Among the first groups to achieve fame were the Cuarteto Oriental and some years later the famous Trio Matamoros. At the beginning of the twenties Havana experienced a major influx of orientales (people from 'Oriente') and due to their cultural influence Son became more and more accepted in the Capital. The 'Habaneros' (people from Havana) fell in love with the new rhythm and immediately put their peculiar stamp on it, speeding up the tempo, and playing it with six musicians. During that period new groups such as the Sexteto Bolona and the Sexteto Occidental were formed and others, like the Cuarteto Orientall becomeing the Sexteto Habanero, adapted to the new conditions. A young musician named Ignacio Piñeiro still was not satisfied by the existing sound of the Son groups. This sound was mainly based on vocals percussion and strings. Thus in 1927 he created his own group: the 'Septeto Nacional' adding, for the first time in the history of Son, a trumpet as lead instrument. 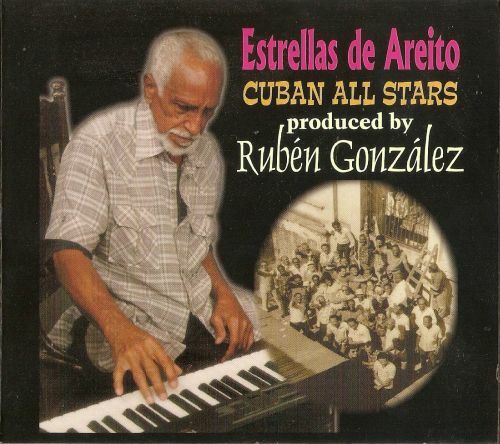 This completely changed the sound and Son quickly became the most celebrated music in Cuba. Not long after, it also became well known outside the country. When in 1928 Son and Septeto Nacional were the sensation of the World Exposition in Sevilla. Son was here to stay and became the basis for many other music styles. like Mambo and Salsa. Today, after more than seventy years of success, the "Septeto Nacional" is still alive and kicking. The CD consists of 14 tunes and songs, 6 of which are Sindhi and 3 Seraiki (a dialect of Sindhi). The other 5 are Pushto, Punjabi and Urdu and obviously of a different character. perform pujas, or blessing ceremonies, to drive away evil spirits. easiest to charm because of it being "mad about music". 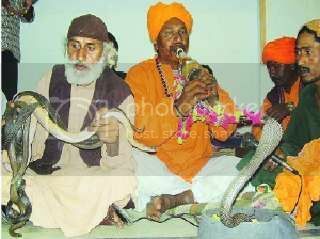 he occassionally feels he is meeting the great spirtual leader of the Jogi, Gogo Chuhan, to whom the opening piece of music in performance always refers." Urs Bhatti is thought to be the finest alghozo (dadaru joro) player "from Puckachang to Jaipur". He is the only living student of the legendary jogi Misri Khan Jamali, the late grandmaster of alghozo, who is widely acknowledged to be the greatest player in this century (saiin Jamali became famous in the early 1940s). Urs Bhatti plays two Sindhi raags (compositions), Kohiyaari and Rano, on this CD. 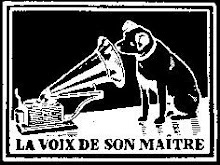 As usual with the Western CDs, the four minute pieces offer only a glimpse of a grand peformance but clearerly this music has the power to enchant not only snakes but bipeds too (actually, even our family dog, who has gone virtually deaf in the normal human voice range, goes and sits next to the speaker when saaiin Bhatti's song comes on). I think just these two pieces alone are worth the price of the CD. disciple of the Sufi Laal Shahbaz Qalander ("dhamaa dham must Qalander.."). Rubeena is a virtuoso player of the single-stringed Yaktaro and the first woman to achieve fame playing that instrument. muhinjo re pechu punhala saan.."
with Sindhi music but can be appreciated on their own terms. 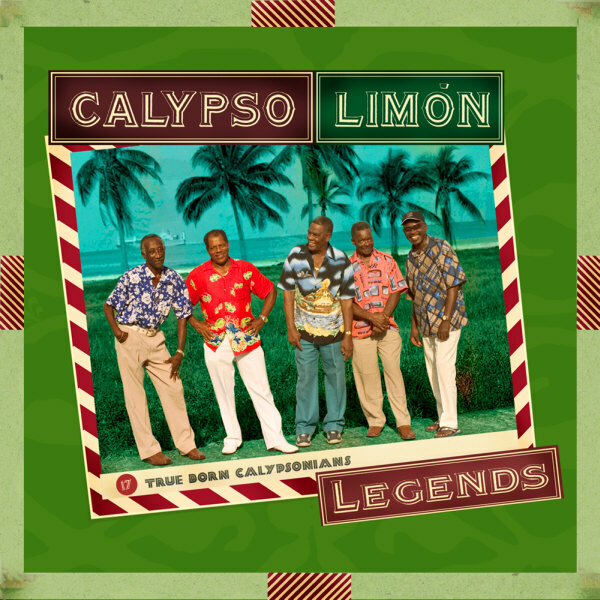 Calypso Limon Legends contains the tradition of the glorious age of calypso carnival bands, but it its strengthened by a New Orleans style jazz piano, which gives this recording a fresh new sound. 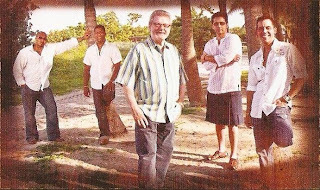 The band is the result of a long research of the parallel paths of calypso and jazz, which finished with the series of concerts entitled "Calypso - Jazz wednesdays", a periodical gathering directed by master pianist Manuel Obregon and calypso expert Manuel Monestel. They departed from a deep investigation and their enormous talents in jazz and calypso to experiment alongside some of the major living legends of Costa Rican calypso. 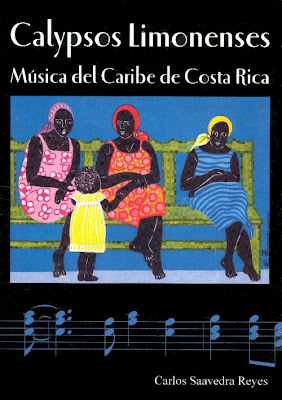 This CD is the fruit of a long research of the parallel paths of calypso and jazz, which finished with the series of concerts entitled “Calypso - Jazz Wednesdays”, a periodical gathering directed by master pianist Manuel Obregón and calypso expert Manuel Monestel. They departed from a deep investigation and their enormous talents in jazz and calypso to experiment alongside some of the major living legends of Costa Rican calypso. The research process, the concerts and their recording were possible thanks to the colaboration of the Costa Rican Ministry of Culture and the Spanish Cultural Center. In this production recorded live, we revive the most famous songs from the 1950s and 60s, back when neighborhood calypso bands where the main attraction in Limón Carnival days. 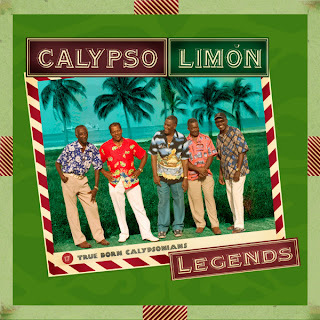 Calypso Limón Legends contains the tradition of the glorious age of calypso carnival bands, but it its strengthened by a New Orleans style jazz piano, which gives this recording a fresh new sound. Sound engineer Draxe Ramírez, is one more star of this production, thanks to his months of precision work to transform the concert recordings from rough diamonds into bright musical gems. The five singers we hear in this production are the authors of songs that became true landmarks of Afro Costa Rican culture. Cyril Sylvan is one of the few singers who have kept the style perfected by Panamanian calypso legend Lord Cobra, one of the household names of Central American calypso. Cyrilo was a fisherman and butcher in Port Limon's main market for 40 years and lead singer for the carnival bands “Lobsterband” and “Skelintans” from the notorious Cieneguita neighborhood, where his brothers, nephews, his daughter and even his mother also performed. After belonging to several calypso bands, Reynaldo Kenton “Shanty” has always been devoted to music. He was part of the canrival bands Lobster Band and Skelintan by Sylvan, and he continued to interpret calypsos of the great composers from Port Limon in groups like New Revelation, a band from the neighborhood of Cieneguita, founded by reknowned Julio Medina. 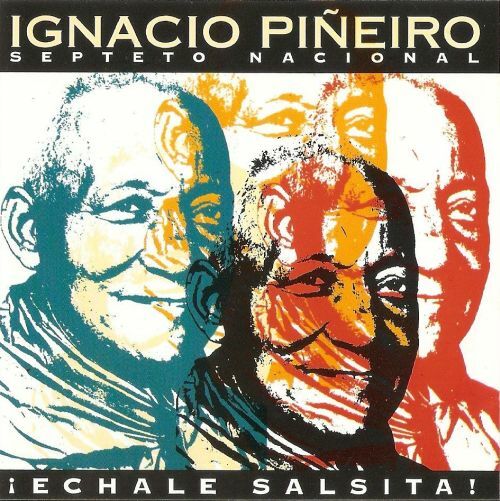 This is one of the few bands from Costa Rica to be included in Radio France International's compilations. Originally from Bluefields in the Nicaraguan Caribbean coast, Emilio Álvarez “Junny” has been a sailor and a boat mechanic, but he has also traveled Central America and the islands of the Caribbean with the group Bárbaros del Ritmo, predecessor of the famous Dimensión Costeña. His wide experience with contemporary calypso and his ability with the electric bass made Junny vital for Calypso Limon Legends. Herberth Glinton “Lenkí” is also impressive on stage since you wouldn't expect a man so apparently fragile to be capable of producing the heartrendering voice he produces to sing his songs “Fire” y “Nowhere like Limón”. Besides, passionate fan of blues and country music, Lenkí also interprets a version of the classic country song “Please help me I'm falling”. All the way to New York went Roberto “Congoman” Watts to record his “Carnaval en Puerto Limón”. Tailor and barber from Port Limon and raised in Panama, “Congoman” cofesses he has always been inspired by Clarence Martin “a grand musician” whose music taught him to appreciate jazz. Here, Congoman plays a song by Lord Kitty, who he met in Panama. Manuel Obregón has turned his career into a sampler of the genres that exist on Central America. Obregón has researched deeply the historic relationship between Central American calypso, blues and New Orleans Jazz music. In New Orleans, he learned the musical forms and style of Jerry Roll Morthon, and Louis Russell, pioneers of swing and calypso jazz. 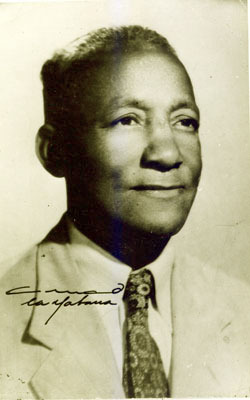 He has also established a strong exchange between Central America and Louisiana, participating in the Internacional New Orleans Jazz Festival with Orquesta de la Papaya in the Festival Internacional de Lafayette, in the New Orleans Piano Night and he won the Best Concert Award in 2000 for his performance in Snug Harbor with the Calypso Jazz Trio with Jhonny Vidacovich. In October 2000, he is declared International Honorary Citizen of the city of New Orleans, and in August, 2005 he was selected by the University of Tulane to form the Institute of Culture of the Americas and the Latin Festival in New Orleans, but the project was interrupted by the emergency due to hurricane Katrina. In November 2005 he founded the First Calypso Festival in Bocas del Toro with Manuel Monestel and Romulo Castro. Fine balance between academic knowledge and musical talent best describe Manuel Monestel. His deep interes for researching original Limon style calypso have permitted entire generations of Costa Ricans to get acquainted with this music and appreciate it. His vast musical production with several bands, especially as musical director of the band Cantoamerica during its more than 25 years of existance, competes with his numerous publications in his 30 odd years of curiosity. Due to this background, Manuel Monestel has perfected beautiful versions of songs by Walter Ferguson, Lenkí, Buda, and many other emblematic composers from the Limon province, apart from having built an ample repertoire of his own creations. His recently published “Ritmo, Canción e Identidad: el Calypso Limonense”, the most profound and most well founded book ever written about this music. Besides, he has participated in lots of international music festivals around the world, such as April in Managua, the Vancouver Folk Music Festival, the Olof Palme Festival, the Benefit Concerts for the Christic Institute in California, the Paul Masson Summer Series, the Cabrillo Music Festival, Concierto Mundial Por La Vida, Cali, Colombia, Festival de Cultura del Caribe 96 in Can Cun, México, Festival Musical Latinoanericano and Festival Musical Latinoanericano in Puerto Rico, the Central American Coffee Carnival in Taiwan, Festival Mundial de la Juventud in Panamá, New Orleans Jazz and Heritage Festival, and in several editions of the Festival Internacional de las Artes in his native Costa Rica. Semi-abandoned train yard in Puerto Limon (Costa Rica). 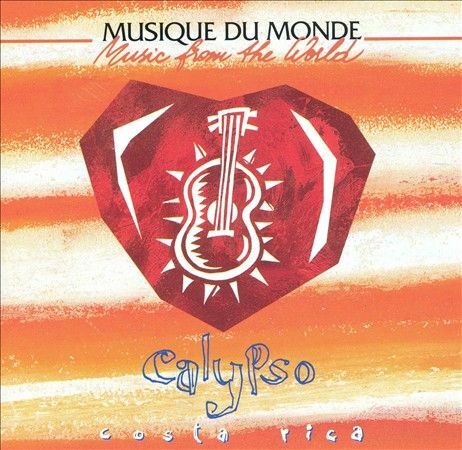 Calypso songs in Spanish and English. Puerto Limon’s big festival of the year is on Columbus Day (October 12th) when the whole town parties to the sounds of raggae, calypso and salsa. Street parades, music, dancing and drinking go on for days and people come from all over the country to party with the Limonenses. 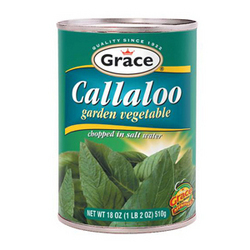 Calypso music is also still popular, although since the 1970’s raggae has replaced calypso as Puerto Limon’s favorite kind of music. 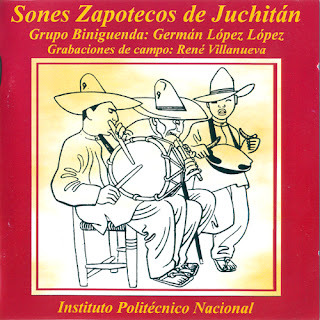 Such groups as New Revelation, Charro Limonense and Cahuita Calypso are still popular, singing in both Creole English and Spanish. A collection of their songs can be found on the excellent CD Calypso Costa Rica (1996). Most blacks in Limon speak both Creole English and Spanish. Many younger Limonenses speak only Spanish. Afro-Antilleans in Limon province number around 80,000, with 50,000 or so others living in other parts of the country, mostly in San Jose and in the larger cities of the meseta central. Creole English is spoken not only in Puerto Limon and in the areas where the Afro-Antilleans settled to work, but also in small communities scattered along the Caribbean coast south of Puerto Limon towards the Panamanian border. 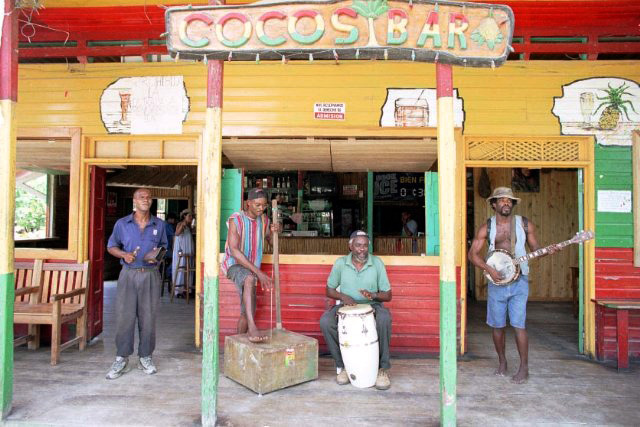 Small towns such as Cahuita continue to show off their Creole culture in music, dancing, cooking, language and the use of medicinal plants reflecting an African heritage. The village of Puerto Viejo de Talamanca is inhabited by both Creoles and native Americans who live and work side by side. you want to sing along? In Costa Rica, the calypso and other afro-caribbean rhythms are mostly important in the Province of Limón, where most of the Jamaican immigrations first came in the nineteenth century. Cuarteto Patria was founded in 1940 by María Emilia García, a singer and maracas player. From the beginning, the group followed the tradition of the trova style left behind by Ñico Saquito, Miguel Matamoros and Los Compadres -the duo formed by Lorenzo Hierrezuelo and Compay Segundo-, and, little by little, its popularity has grown up the point where it has become the best known Cuban quartet, winner of numerous awards. For many years now, the leader of Cuarteto Patria is Eliades Ochoa. He joined the band when veteran group leader Roberto Echeverría left Cuarteto Patria in 1978. Until then, the legendary group had not recorded any albums despite its popularity. 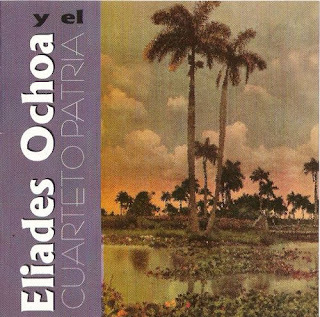 With the addition of Eliades Ochoa, Cuarteto Patria started its international career, playing since then in Europe, Mexico and even the United States. In addition, the music repertoire was expanded from the original bolero and criolla, Cuarteto Patria's specialties, to include son montuno, guaracha and guajira. All of it perfectly integrated in a natural way by a group bent on preserving the best musical tradition in Cuba with an essential line-up: guitars, acoustic bass, percussion and well harmonized vocals. 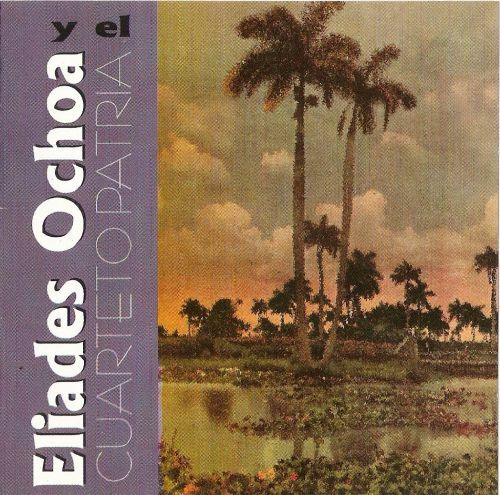 In 1997 Eliades Ochoa participated in the Buena Vista Social Club project, that Ry Cooder produced, bringing together some of the best performers of Cuban son. Today Cuarteto Patria is made up of Eliades, with his brother Humberto on second guitar and two young musicians, William Calderón on acoustic bass and Roberto Torres who plays bongos and congas. Ojalá se seque el mar. ¿por que? ¿dime por que? The great legacy of Cuban music is in wonderful songs, fine lyrics, exquisite harmonies, superb arrangements -- whether for two guitars and bongo, or a sextet adding double bass and guiro, or a septet with a trumpeter and clavé. As this style evolved at a leisurely pace over the course of the twentieth century, many groups such as Trio Matamoros and Septeto Nacional came to it and added to the style we know as Son. 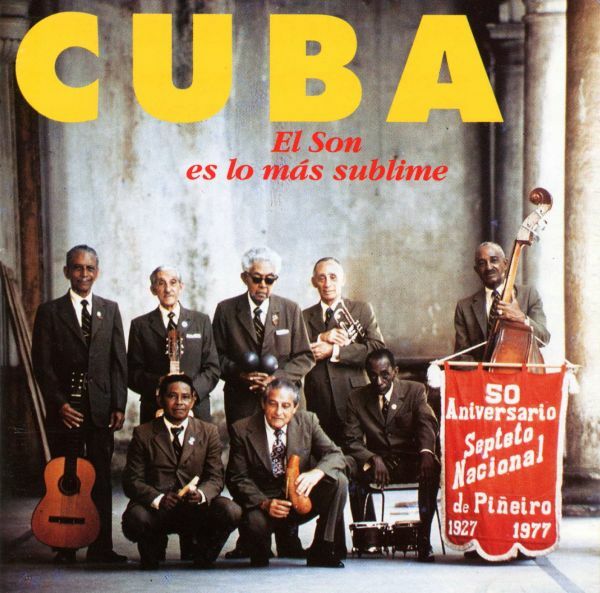 While son is one of the most influential musical forms to come from Cuba, it is not as familiar as the rumba, mambo, or cha cha, which evolved from it. It starts from simple guitar riffs backed by percussion, but most of the melodic weight is carried by raspy vocals, which add charm to the music; occasionally a trumpet adds to the mix of ragged voices. All of these discrete components blend to create one of the most memorable, intoxicating sounds on the planet. The Swiss label ASPIC licensed a compilation of the best and most characteristic Son tunes (with two of its offshoots, bolero and montuno) from Egrem to give you an introduction to the groups and sounds of the genre. By now you probably know "Chan Chan," "Suavecito," and "Lagrimas Negras." Here they are in the original (beautifully remastered) recordings laid down on 78 rpm shellac discs by the great exponents of the genre: Francisco Repilado, Ignacio Piñeiro and Miguel Matamoros, and their respective groups. The best part is the music sounds like it was recorded yesterday. We hear each member of the small groups, right down to the percussionists who are soloing brilliantly through the whole number, creating a complex layering of sound that remains astoundingly clear and concise. Trumpet, upright bass, bongos, guitars and vocals dance through these selections with a sweetness and melancholy that has never been recaptured in the fifty years since these recordings were waxed. Indeed, as Ignacio Piñeiro avers in "Suavecito," "there is nothing more sublime than son." Large numbers of African slaves and European (mostly Spanish) immigrants came to Cuba and brought their own forms of music to the island. European dances and folk musics included zapateo, fandango, paso doble and retambico. Later, northern European forms like minuet, gavotte, mazurka, contradanza, and the waltz appeared among urban whites. There was also an immigration of Chinese indentured laborers later in the 19th century. 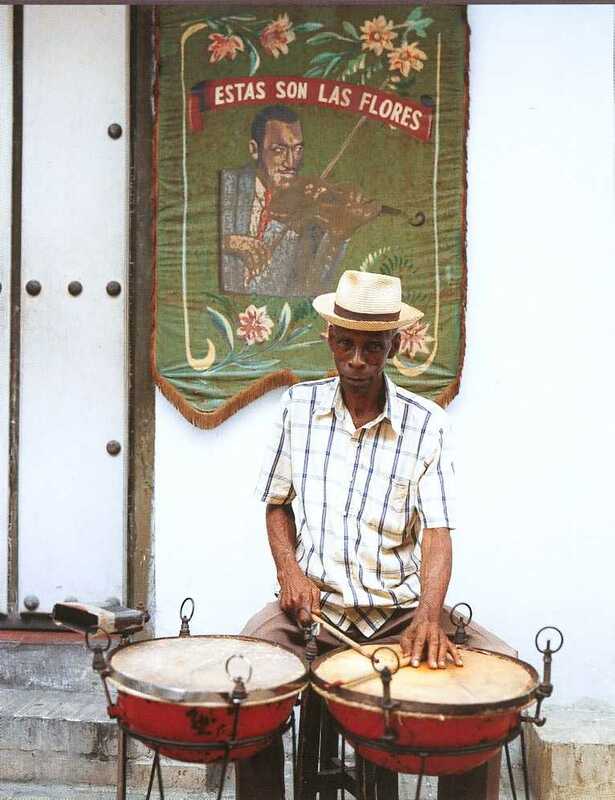 Fernando Ortiz, the first great Cuban folklorist, described Cuba's musical innovations as arising from the interplay ('transculturation') between African slaves settled on large sugar plantations and Spaniards or Canary Islanders who grew tobacco on small farms. The African slaves and their descendants made many percussion instruments and preserved rhythms they had known in their homeland. The most important instruments were the drums, of which there were originally about fifty different types; today only the bongos, congas and batá drums are regularly seen (the timbales are descended from kettle drums in Spanish military bands). Also important are the claves, two short hardwood batons, and the cajón, a wooden box, originally made from crates. Claves are still used often, and cajons (cajones) were used widely during periods when the drum was banned. In addition, there are other percussion instruments in use for African-origin religious ceremonies. Chinese immigrants contributed the corneta china (Chinese cornet), a Chinese reed instrument still played in the comparsas, or carnival groups, of Santiago de Cuba. The great instrumental contribution of the Spanish was their guitar, but even more important was the tradition of European musical notation and techniques of musical composition. Hernando de la Parra's archives give some of our earliest available information on Cuban music. He reported instruments including the clarinet, violin and vihuela. There were few professional musicians at the time, and fewer still of their songs survive. One of the earliest is Ma Teodora, by a freed slave, Teodora Gines of Santiago de Cuba, who was famous for her compositions. The piece is said to be similar to ecclesiastic European forms and 16th century folk songs. Cuban music has its principal roots in Spain and West Africa, but over time has been influenced by diverse genres from different countries. Important among these are France (and its colonies in the Americas), and the United States. Cuban music has been immensely influential in other countries. It contributed not only to the development of jazz and salsa, but also to the Argentinian tango, Ghanaian high-life, West African Afrobeat, Dominican Bachata and Merengue, Colombian Cumbia and Spanish Nuevo flamenco. The African beliefs and practices certainly influenced Cuba's music. Polyrhythmic percussion is an inherent part of African music, as melody is part of European music. Also, in African tradition, percussion is always joined to song and dance, and to a particular social setting. 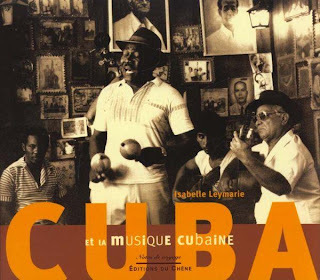 The result of the meeting of European and African cultures is that most Cuban popular music is creolized. This creolization of Cuban life has been happening for a long time, and by the 20th century, elements of African belief, music and dance were well integrated into popular and folk forms. Cuba et la Musique Cubaine. Editions du Chêne, Paris, 1999. Three years after the infamous Estellas Areito sessions of 1978 were recorded, Ruben pulled these guys back together for an amazing reunion. This CD represents the best of the wonderfully rich range of Cuban music, from son to danzon/cha-cha to heat-inducing descarga. "If I can't take a piano with me to Heaven, then I don't want to go." "I like to leave a gig as soon as it's over." Recorded at Areito EGREM, Havana, Cuba. 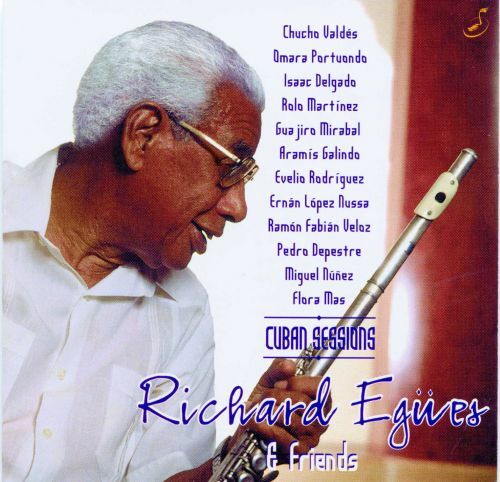 Flute player Richard Egües' three decades of work with Orquesta Aragón established him as one of the best (perhaps the best) practitioners of his instrument in the history of Cuban music. Aragón was a charanga -- an orchestra consisting mostly of strings and a rhythm section, with flute and violin as the lead voices; charangas originally played refined ballroom dances but later took a crucial role in creating the livelier cha cha. Egües arrived on the scene not long after improvisation had become a requirement for charanga musicians, and though he hadn't originally set out to become a flute player, his inventive performances with Aragón from 1954 all the way through 1984 set the highest possible standards of musicianship for flute players in the charanga format. Richard Egües was born in the town of Cruces, in the Cuban province of Las Villas; he was brought up alternately in the towns of Sancti-Espíritu (where he attended school) and Santa Clara (where his family resided). Egües' father landed a job leading the municipal orchestra of Manicaragua, and young Egües accompanied him there; his father allowed him his first performance experience playing cymbals. Egües began learning piano and clarinet, and soon branched out into saxophone as well. Around 1940, Egües' father founded his own orchestra, Monterey; Egües performed in it and also married around the same time. In 1943, he returned to Santa Clara hoping to prepare for a move to Havana by soaking up all the performance experience he could in the Santa Clara cabarets. Egües began playing both sax and piano with many different groups around Santa Clara. In the late '40s, he decided to pick up the flute as well, partly because flute players got to take more breaks during performances, and partly because the municipal orchestra of Santa Clara had an opening for a flute player. He got the job, and through that gig met Orquesta Aragón, who needed a flute player to occasionally fill in for their original flutist, Efrain Loyola. Egües initially turned down the orchestra's offer of a full-time position, which they then gave to Rolando Lozano; Egües, however, remained a dependable substitute, and when Lozano left the group in 1954, Egües accepted the job as his full-time replacement. With his extensive musical training, Egües became not only one of the band's chief instrumental stars, but a major talent in the fields of composition and arrangement as well. Along with violinist Rafael Lay Apezteguia -- the man essentially responsible for introducing the cha cha form (though he did not invent it) to the charanga orchestra -- Egües played a crucial role in giving the orchestra its signature voice: a light, airy, elegant sound, yet one that was driven by virtuosic, freewheeling improvisation. Despite their original base outside of the music hub of Havana, Orquesta Aragón became a world-renowned performing outfit, thanks in part to Egües' own personal popularity. Egües left Orquesta Aragón in November 1984, two years after Apezteguia was killed in a car accident. He founded his own orchestra, handling most of the composition duties, until he was forced to leave due to rather serious kidney problems. 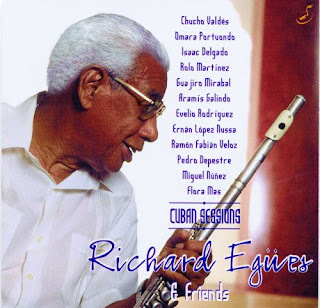 However, he was still able to record the album that became his first solo release in the United States in 1999; Richard Egües and Friends: Cuban Sessions was a guest-star-studded affair that captured Egües' flute playing in all its vitality. Nombre: Eduardo Richard Egües Martínez. Fecha de Nacimiento: 26 de Octubre de 1926, Cruces, Cienfuegos, Cuba. Murió: 01 de Septiembre del 2006, La Habana, Cuba. If a classical musician wants to take a dip in the jazz pool, there’s no better way to start than with the compositions of Claude Bolling, the French composer who blends Baroque and jazz in his suites. Flutist Galway at least dips his toes in the pool on this recording, which includes a new take on themes from Bolling’s Suite for Flute and Jazz Piano Trio. What’s new is an Afro-Cuban beat and feel courtesy of the Cuban timba quartet Tiempo Libre, whose members provide most of the jazz improvising as well as the tropical rhythms. The seven titles from the Bolling suite are refreshed by the added Afro-Cuban elements as much as they are enhanced by Galway’s richly expressive tone and humanly emotional phrasing. And though he leaves almost all of the improvised soloing to the engaging pianist Jorge Gomez, he also spins off a virtuosic, jazzy cadenza on the final suite track, “Espiegle,” that could teach jazz flutists a thing or two. Four Gomez originals and his arrangement of J.S. Bach’s “Badinerie” complete the album. 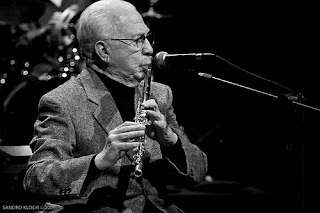 While Gomez, bass guitarist Tebelio Fonte, and even percussionist Leandro Gonzalez and drummer Hilario Bell provide most of the Latin-jazz improvising, Galway shows he’s mastered playing in the clave and other Afro-Cuban rhythms, his lead flute dancing and prancing over the rhythms and occasionally adding variations, if not full-fledged improvisations. Commented Galway on this album: I think this is one of the most outstanding recordings I've ever been involved in and I'm very excited about it...at my age to get to do this sort of thing is fantastic!". To put the Cuban connection into context, Galway--an avid history buff--had been fascinated to learn about a fellow Irishman, General O'Reilly. 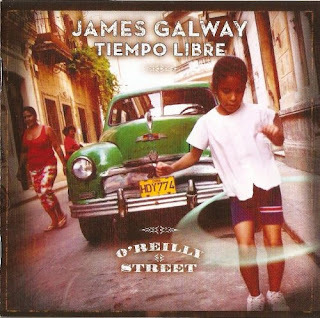 O'Reilly was a key military strategist in Cuba and has a street in Havana named after him, hence the title of the new album. Furthermore, many of the cities where Tiempo Libre's members were born count the Irish among the original settlers in the 18th century. The Zapotec people of Oaxaca have developed and preserved a culture of strong personality and distinctive. One of them is language. Despite the common origin, they differ by geography variants that are up to six or nine, according to the authors who classified. His tonal language status (tone of voice determines the meaning of the word) makes this language has a musical sound. 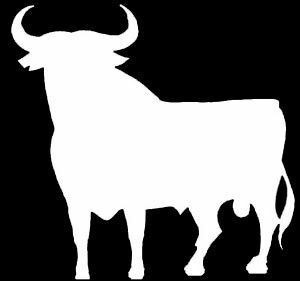 While he has received many Spanish loans, has retained its strong structure basically unwritten language preserved by oral tradition. However poetry and songs are composed and until recently has started her writing. Juchitán is an important center of Zapotec culture, preserved and transmitted by its inhabitants speak mostly of the ancient language than Spanish. Tracing the flute or whistle Zapotec heard in the field recordings in 1965 with the strong support of the painter Francisco José Raúl Hellmer Toledo made the masters of the flute Don Lopez and Isidro Melesio Regalado, wanted to assess how much the tradition was preserved after more than thirty years he had done his research. The agaves that he met and recorded as dead, so the question was valid. Fortunately for us, awareness and appreciation of their culture with the people Juchiteco now allows us to enjoy this tradition through the transmission is maintained through generations. The transmission of culture as a value which we pass from one to another generation, a fundamental guarantee for the peoples: identity and roots, which are not incompatible with progress and changes that each season brings, but on the contrary, allow how to select the elements of these changes to assimilate when they go in the sense of history and feel of each town and not the result of external imposition of so-called modernity are but the old tactics of dispossession and subjection to hegemonic powers with ideology archaic but equipped with technologies developed. 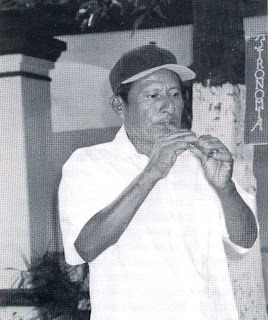 Thanks to that cultural transmission, the young musician Heberto Torn Juchitán introduced me to his flute master Don Germain López López, who agreed to be recorded part of his vast repertoire. Don Germain says: "The traditional Zapotec flute with eight holes, six up, one down and one back. Special reeds are used longer, to accommodate the holes and the nozzle. Now scarce the reed, because it cleared the river after Cyclone flooding Paulina. 're growing some but are very short and does not reach out a flute. The reeds grow in the most mountainous part of the river, where there are more trees. As long sticks In the air, so there grows, there is growing longer the joints. They are in a part that tells isunaa, Paso Cruz. For all this part near the village, most were not. I also makes drums and flutes. The drums that do not are parts, the body is one piece of guanacaxtle, a very fine wood, hollowed out with gurbia. There are still some of that wood, because it reaches the mill and takes it all. The straps are frijolillo and is leather tie deer or goat, the patches are also goat. There are drums of different sizes. It used to be played with one drum pore now use the bass or drums, and is heard more beautiful. The sticks are all wood. It touches with a tortoise shell and given to deer. It is played here. The huaves play with different shells and their music is different. " The reed flute is Juchiteca seven holes, six in front and one back, which has peak mouth air duct is made of wax. Is adapted to Western notation, but by crafting the pitch and tone are in most cases approximate and are resolved at the discretion of performing musician. It is not intended rigor and accuracy of tuning of an instrument of conservatory, suffice to allow playing the traditional repertoire. The traditional set called Piter yaa to play the sounds or sounds authentic Ismene accompanying the flute has two double patch drums, one big drum and bass sound or other acute or snare sound. A tortoise shell hammered with two deer antlers complete the envelope and give the set a rich tone. The shell is involved along with two drums on the old tunes that Don Germain called pre-Hispanic and retain more features and elements Zapotec Indians. The two drums acompaflan to traditional tunes, many of which agaves have been adapted for the flute, as are those who dance at parties, as Anastasia, The Marena. La Llorona, etc. 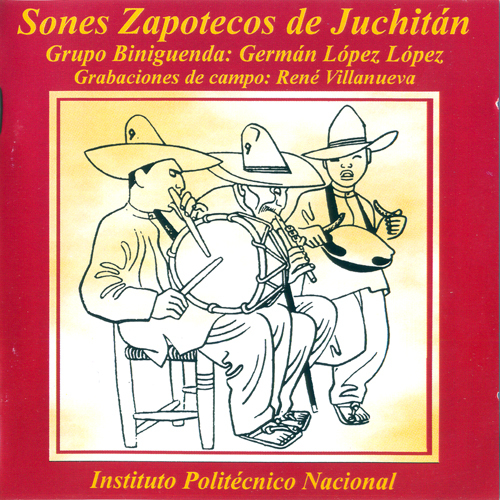 This recording is the way of gratitude, knowing and recognizing the beauty of the music of the Zapotec people, as well as a fitting tribute to the art of Mr. Germain López López, master of the flute.